Acupuncture continuing education online courses at HealthCMi are valid throughout the USA and Canada. We feature NCCAOM PDAs and state acupuncture continuing credits including California acupuncture CEUs, Texas CAEs, Florida CEs and much more. Click on a state above to learn more about your state requirements. Take a look at the links below to learn more about NCCAOM PDAs and other acupuncture continuing education re-licensure information. NCCAOM Safety, Ethics, & CPR PDAs are also available online at HealthCMi. 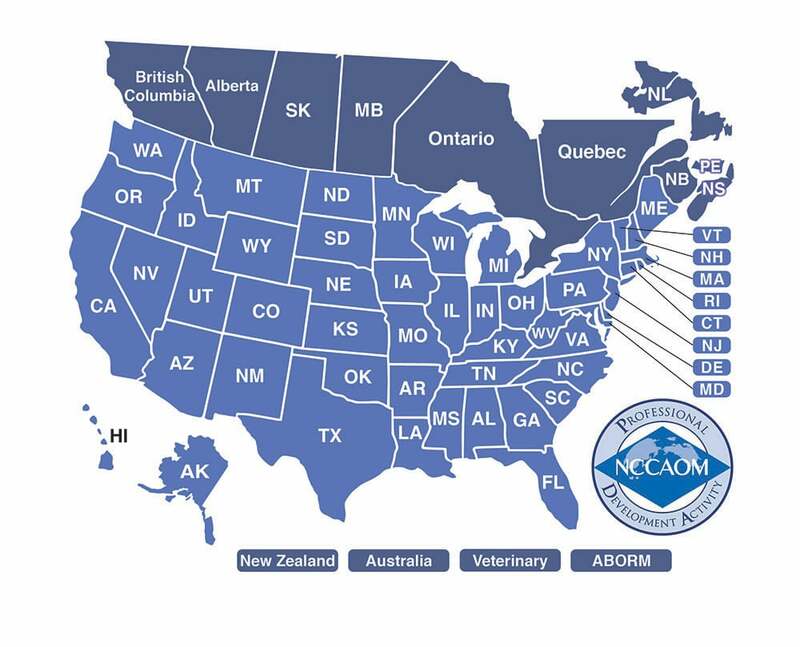 NCCAOM National Diplomate PDAs/CEUs (provider #602) This covers most states. HealthCMi anytime courses may be taken 24 hours a day, 7 days a week. Our automated system allows acupuncturists to download course eBooks and videos, take online quizzes and receive official certificates of completion for acupuncture continuing education credit. Many acupuncturists enjoy our US mail and email option. Simply contact us and we can send a hard copy or email copy of the course materials, quizzes and certificates of completion directly to you. At HealthCMi, we offer NCCAOM Diplomate online courses approved for general credit and special courses certified for the four hours of NCCAOM Safety and Ethics requirements.